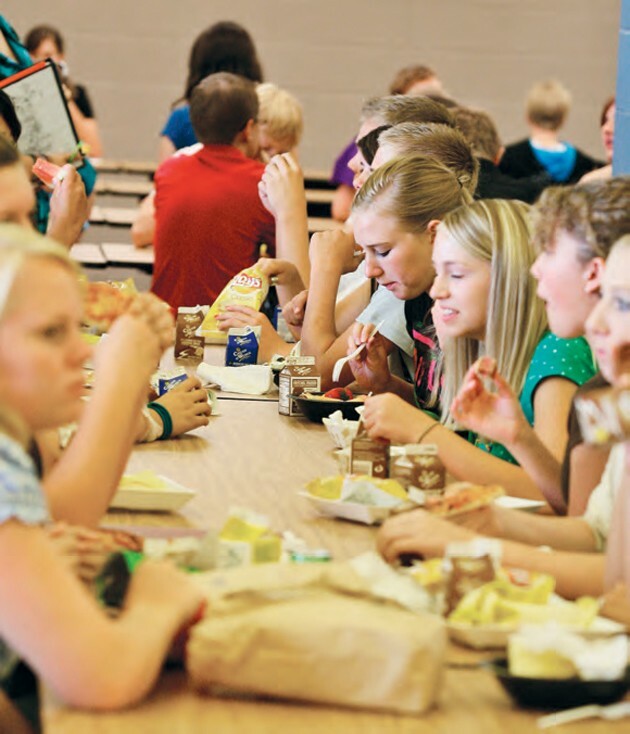 Students eat lunch at Stansbury High School in 2009. At school a few weeks ago, I really wanted a hamburger and fries for lunch. I got in the “fry line,” as it’s called at our school, and found myself waiting for roughly 20 minutes. That wouldn’t normally be a problem, but I was already about five minutes late to lunch in the first place. Once I had my food and was sitting down with my friends, I checked my phone for the time. I only had five minutes left to eat. Sadly, I ended up throwing away a lot of the food because I didn’t have time to eat. Grantsville, Stansbury and Tooele high schools are on a block schedule, which means we have our first four class periods on A days and our four other class periods on B days. At all three schools the day starts at 8 a.m. and ends at 2:35 p.m., which means every school day is exactly six hours and 35 minutes long. The block schedule gives students 30 to 35 minutes of each day for lunch, depending on the school. The three schools also all have two different lunch periods in order to make room for the large amount of students in the cafeteria. As I was thinking about how lunch works at my school, I wanted to figure out how many students the lunch staff would have to feed per minute in order to feed everyone. Of course the numbers I found were a bit off because some kids are absent for lunch or bring their own lunch, but as of October 2011, there were 1,487 students enrolled at SHS, 729 enrolled at GHS and 1,414 enrolled at THS. Grantsville High School has approximately 364.5 kids in each lunch period. Each lunch period at GHS lasts only 30 minutes. This means Grantsville must feed 12.2 students every minute. That does not include teachers and staff eating and it doesn’t leave the students who are in the back of the line any time to eat their lunches. If every student enrolled at Grantsville High were to buy school lunch, a student would have to be served every three seconds. Stansbury High School has around 743.5 students at each lunch period. Stansbury High’s lunch periods are 35 minutes long. At SHS there are about 12.2 students that should be getting their food every minute. Again, that isn’t leaving any time for the students at the back of the line to eat, and it doesn’t include faculty and staff. If every student enrolled at SHS decided to buy school lunch, ever four seconds a single student would have to be served his food. The two lunches at Tooele High School are both 30 minutes long. Each lunch has roughly 707 students waiting in line. With 707 kids in each lunch period, 23.5 of them have to be served per minute. That means every three seconds one student would have to be served. Even though I get frustrated when I don’t have enough time to eat my lunch, the problem isn’t the way the lunch room staff works. Have you ever tried to feed 23.5 starving teenagers in a single minute? You probably haven’t — and not very many people can say they have. The lunch room staff can’t do a better job than they are already doing, and I have to give them major props for feeding so many kids like they do. The problem is that it is next to impossible to feed up to 743 students in the time span of a half hour. It’s my hope that the Tooele County School District will notice the need to adjust the lunch periods so that we have more time for lunch, even if it means we have to stay at school a little later or come in a little earlier. Kristine Johnson is a junior at Tooele High School.